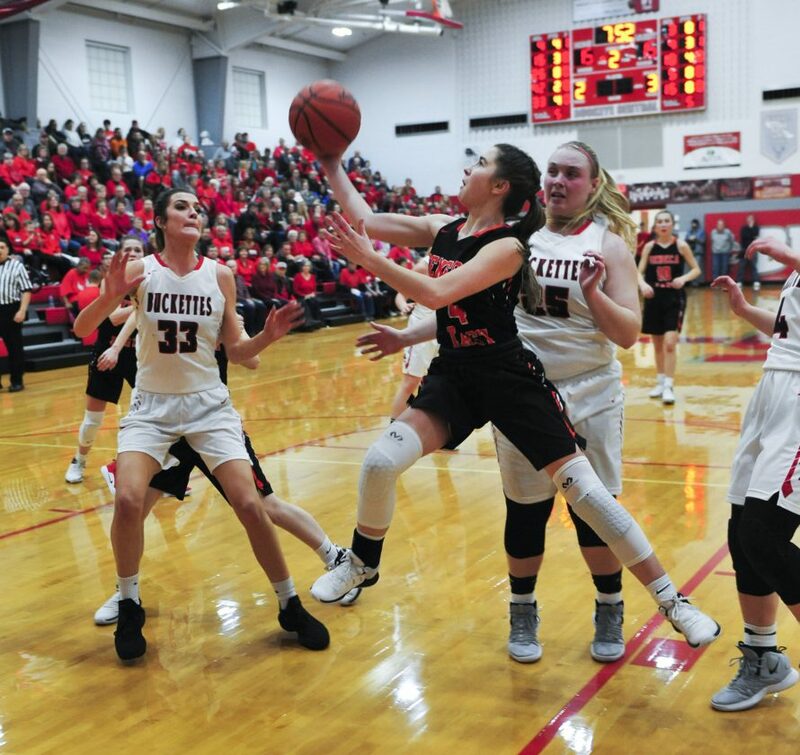 PHOTO BY REBECCA PADULA Emily Siesel goes up for the basket as Buckeye Central's Lexi Evak (33) and Courtney Pifher play defense in Thursday's game in New Washington. NEW WASHINGTON –Jess Bowerman simply wouldn’t let Seneca East lose Thursday night. It didn’t matter that she missed the majority of the second quarter at Buckeye Central after picking up two fouls. It didn’t matter that without her on the floor, the Tigers endured a scoreless stretch that went well over eight minutes. And it didn’t matter that, early in the fourth quarter, Seneca East was coming perilously close to falling too far behind the Bucks to avoid its first Northern 10 Athletic Conference loss of the season. Elizabeth Heydinger’s bucket with 6:21 to go in regulation put the Bucks ahead, 39-31. But Bowerman — and the Tigers — wouldn’t be denied. The Seneca East sophomore finished with 26 points and eight rebounds, while teammate Marina Adachi added 22 points. It was enough — along with a game-extending basket from Alexis Hicks at the end of the first overtime — for the Tigers to do something they hadn’t done in more than three decades. With its 63-56 double overtime win in New Washington, the Tigers were able to celebrate the outright N10 title. It’s the program’s first title since joining the conference. Seneca East improved to 19-1, 15-0 in the N10. Bowerman was at her best late. She scored eight of her points in the fourth quarter, and had four rebounds in the second overtime. It was in the second OT that Bowerman made the game’s decisive play. With the Tigers up 57-55 with 1:09 to go, Bowerman was fouled and sent to the line for a 1-and-1. To that point, she had gone 6 of 6 from the stripe. But this time, she missed. But the sophomore raced after the ball and snagged the rebound. Then she cut to the basket and laid the ball in. “I was so adrenalized, we probably should have pulled it out,” Bowerman said. The basket pushed the Tigers lead to four. It was their biggest lead of the contest. Buckeye Central lost despite a 13-point, eight-rebound effort from Claudia Pifher and a 10-point game from Kyleigh Brown. Taylor Ratliff, who had eight points, had a chance to win the game with a running jumper just before the buzzer of the first overtime. It was a classic game. The teams were tied at 15 after one, but then suffered through a combined 1 of 25 shooting performance in the second quarter, one that saw the Bucks outscore the Tigers 2-0. They also have a championship.